A parish poorhouse or almshouse existed at the south-east of Strachan. It was in operation until at least 1900, later being converted to a house known as Haughhead Cottage. The building no longer exists. 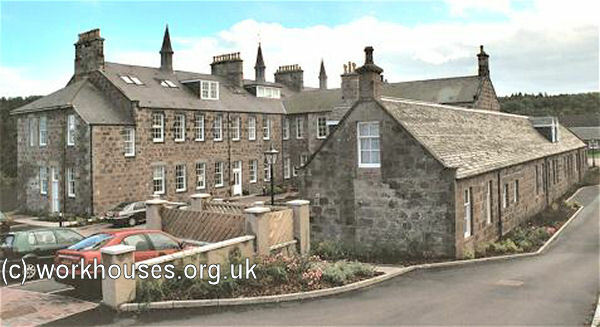 The parish of Banchory-Ternan had a row of four poorhouses located a mile to the north-east of Banchory. The buildings survive as Tilly-Braik (or Tillybrake) Cottages with each of the original pairs of cottages now converted into a single residence. The Kincardineshire Combination was formed in 1865. It initially comprised eleven parishes but this soon grew to fifteen comprising: Arbuthnot, Banchory-Devenick, Banchory-Ternan, Bervie, Dunottar, Durris, Fettercairn, Fetteresso, Fordoun, Glenbervie, Kinneff, Laurencekirk, Maryculter, Marykirk and Strachan. The parish of Benholm was a later member. The total population of the member parishes in 1881 was 30,615. 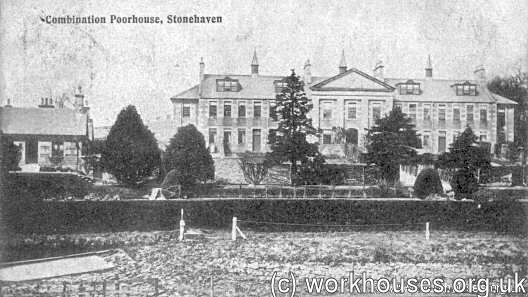 The Kincardineshire Combination poorhouse was erected in 1867-8 on Woodcot Brae at the south-west of the Stonehaven. Its location and layout are shown on the 1903 map below. Stonehaven from the east, c.1905. An entrance lodge stood at the south-east entrance to the site. 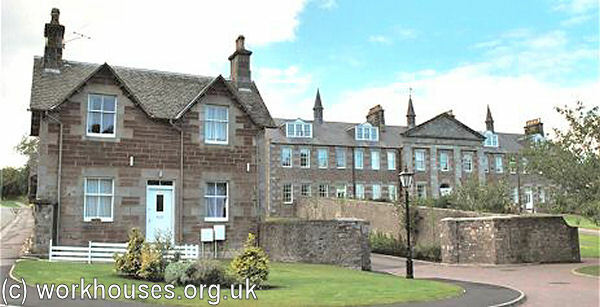 Stonehaven entrance lodge and main block from the south-east, 2001. The main building was a typical H-shaped layout. The larger front block at the east was a corridor plan building with a central portion which would have contained the Master's quarters, committee rooms and clerk's office. The two wings of the front block contained male and female accommodation, probably with the aged at the front side and able-bodied or "dissolute" inmates at the rear. Children's quarters were usually placed at the far end of each wing. Stonehaven main block from the east, 2001. The poorhouse dining-hall and chapel were located in the central block at the rear. In the rear range of single-storey buildings were found various work and utility rooms including a bakehouse on the men's side and laundry on the female side. Stonehaven from the south-west, 2001. Stonehaven from the north-west, 2001. In 1907, the Board of Supervision published extracts from the previous year's annual report by the poorhouse's governor, James' Hall. The principal employment for ordinary men is in the manufacture of firewood, which is sold in the town at a fair profit. The lunatic inmates are principally occupied in cultivating the five acres of land rented by the Board. During the last year quarter of an acre was laid out in strawberries, which gave a fairly good return, although, owing to heavy rain towards the end of the strawberry season, the later varieties failed to ripen properly. The women are employed in the laundry, kitchen, and general house work. They also knit and make clothing, &c., for the house. In 1930, the building was taken over by Kincardine County Council and became Woodcot Hospital, continuing to provide accommodation for 'the ordinary poor, harmless lunatics, mental defectives and chronic sick'. In 1948, it transferred to the National Health Service and continued in operation until the late 1990s. The buildings have now been converted for residential use. Northern Health Services Archives, Special Collections Centre, The Sir Duncan Rice Library, Bedford Road Aberdeen AB24 3AA. Holdings include: Administrative records (1862-1980); Admissions and discharges (1867-1978); etc.